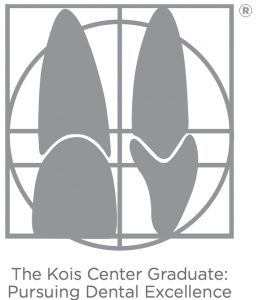 What is a Kois Center Graduate? The Kois Center is a family of dentists and dental professionals who are passionate about dental healthcare and have the discipline to pursue excellence. A heavy emphasis on community exists, and I am proud to associate with the professionals who attend the Center which promotes a culture of generosity, humility, kindness and passion for learning. These individuals are integrity-based and committed to both their patients and education. Dentists who attend the Center seek evidence-based knowledge, willing to question their beliefs in pursuit of excellence. The Kois Center community works to provide the best, most efficient and cost-effective care to their patients and help one another to achieve this goal. Graduates have completed all nine courses in the curriculum at the Center. Once students become graduates, they have the opportunity to attend an Annual Symposium. At the Symposium, current updates based on new studies are discussed, and our community of professionals and their families have the opportunity to network and get to know each other better. Graduates also have the privilege of being part of our referral service on the website, wherein other graduates can search for contact information and refer patients who are moving or are out of town to another highly trained and skilled dentist. Graduates have made a serious commitment to this rigorous curriculum—sacrificing time away from families, home and their practices—challenging themselves to be the best. To achieve this goal has required questioning of traditional standards and examination of strongly held beliefs under the light of published evidence. It has also required the courage and willingness to change, when necessary, how they practice dentistry. Are All Dentists Created Equal? What is the Kois Center? Time for a New Way of Thinking? Why Do You Need That Just to Check my Teeth?